Guys. Cherry season is almost upon us! On most days, I could eat cherries right off the stem. They are the fruit of perfection: Sweet and tart. Crisp and plump. I like to take advantage of the season by getting cherries into almost every meal when I can. From breakfast to dinner and even cocktails, you’ll have to make a few trips to the market to keep up with these amazing recipes! Decadent cookie bars are peppered with sweet cherries and toasted brown butter. You had me at quick. This moist and delicious bread will have your taste buds singing in the morning. Perfect for topping ice cream or adding to your greek yogurt, this easy sauce is created in the microwave! 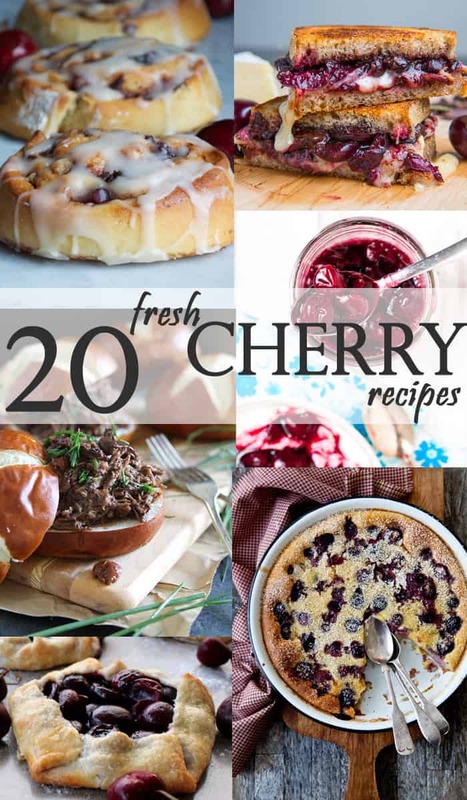 Flaky pastries are loaded with tart cherries and baked to perfection! Savory pork is grilled and crowned with a tart cherry salsa. Loads of cherry salsa infused with basil and balsamic top a healthy grilled chicken breast. 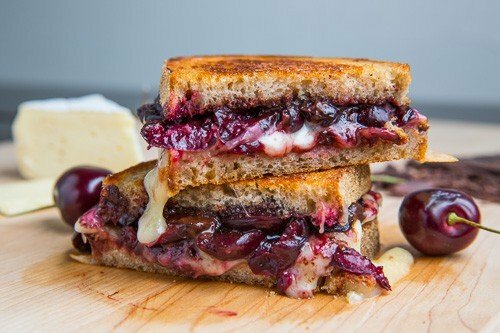 Cherries infuse the beef slowly and the end result is melt in your mouth goodness. Juicy cherries and mint are the star of this quinoa dish that is perfect for summer barbecues. Custardy clafouti is one of my all time favorite desserts. Covered with fresh cherries is the only way to top this pastry. Simple and tasty, these rustic tarts can be made in an afternoon and enjoyed throughout the week. Learn how to make the perfect cheesecake and top it with the perfect fruit! A decadent pool of tart cherries is topped with a wonderfully crisp crust.